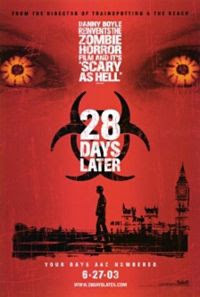 28 Days Later, released in 2002, represents London in a way which focuses on its architecture and the almost unnerving sense of place gained when you remove its inhabitants. Being non-digital, and with few effects as such, it is slightly out of this blogs normal subject matter but while researching for future posts on digital cities and film we were taken with the use of the urban form. The movie clip above provides a walk through of a number of London locations – locations known for their density of population and traffic. As the result of a breakdown of society, following the release of a virus known as “Rage”, which makes people mindlessly violent, there are only four survivors, leaving the city unoccupied. Filming of the unique scenes in an unpopulated London was made possible by closing off parts of the city for a few minutes at a time. By linking theses scenes together, as the clip shows, the architecture of the city dominates and adds to the sense of isolation.